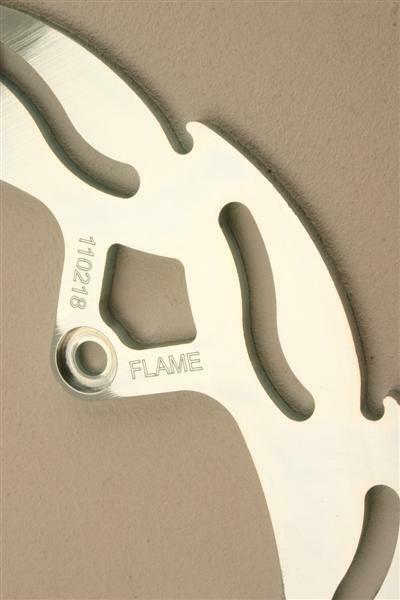 These flame discs are disigned to replace your stock disc for instant performance without relocating your caliper. Moto-Master flame discs are lighter than most standard, so less unsprung weight. 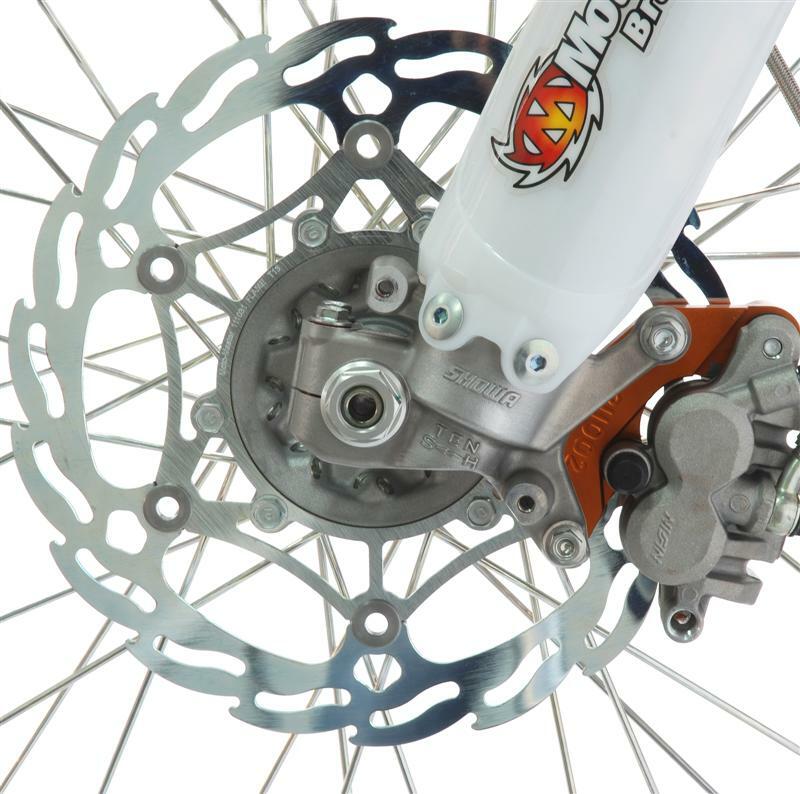 It's special flame design cleans the whole contact surface of the pads without tilting of the pads.This cleaning action is especially important when riding in muddy conditions.Flame design also ensures better cooling, preventing fading on long downhills.The discs are made out of a zinc coated special chrome-molybdenium alloy which has the highest friction level on the market. This gives more stopping power and optimal wear resistance. All discs are laser cut, special heat treated and prescision grinded for perfect fit, superior strength and perfect feel. Moto-Master's oversized flame front rotor is a bolt-on multiple MX world championship winner. 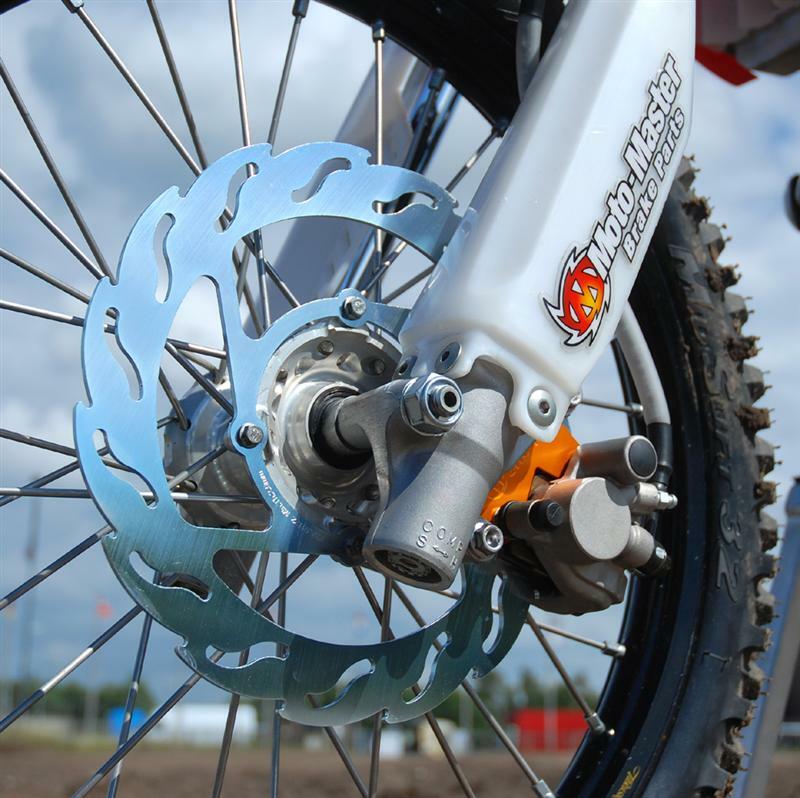 Used by leading professional MX teams all over the world, they offer up to 35% improvement of braking performance compared to stock rotors. They are up to 20% lighter than a stock rotor and fit with our CNC machined billet aluminium adapter to relocate the stock caliper. European bikes can directly fit this 260mm disc without adapter. It's special flame design cleans the whole contact surface of the pads without tilting of the pads. This cleaning action is especially important when riding in muddy conditions. Flame design also ensures better cooling, no fading on long downhills. The discs are made out of a zinc coated special chrome-molybdenium alloy which has the highest friction level on the market. This gives more stopping power and optimal wear resistance. All discs are laser cut, special heat treated and prescision grinded for perfect fit, superior strength and perfect feel. For best performance use our race compound brake pads.